Zagreb is a fun place to visit with a great old town and interesting architecture. It's become a popular tourist destination in Croatia and there is a wide selection of hostels and hotels to choose from. If you're traveling alone, you'll find some great hostels that offer social atmospheres in a pleasant setting. It shouldn't be hard to find an affordable place to stay where it's easy to make some new friends. How much do hostels in Zagreb cost? 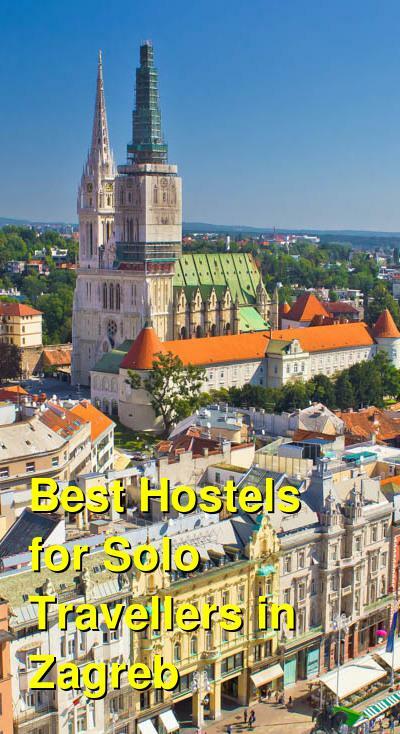 This award winning hostel is a favorite in Zagreb, Croatia. It's located in the historical center of the city and is within walking distance of most of the city's main attractions. It's surrounded by plenty of shopping, cafes, bars, and restaurants and there is public transportation nearby. The hostel is located in a one year old building that has modern furnishings with a touch of history. The hostel is relatively small and intimate, but there are usually other guests around if you're looking for someone to head out on the town with. The hostel has a variety of amenities available including a modern shared kitchen and a comfortable common area. Many guests enjoy hanging out in the common area and listening to music, reading a book, or swapping travel stories. The hostel is owned and run by travelers so they know what you're looking for. If you're traveling alone and looking to make some new friends in a relaxed setting, then this is a great place to stay. Hostel Mali Mrak Zagreb is another small hostel that has a cozy and welcoming vibe. The hostel has several great common areas that make meeting other guests easy. There are also two kitchens, one indoors and one outdoors, so you can enjoy the beautiful climate. The outdoor kitchen is in a nice garden that lets you soak up the setting. The hostel is well designed and decorated and it's a fun place to spend a few days. The staff is wonderful and can help answer any travel questions you may have. They expect you to respect their home and other guests, but they work hard to ensure your stay is wonderful and everyone has a good time. If you're looking for a quiet setting where you can rest and relax, then this is the place for you. This is not the place to go if you want to party. It's a low key environment with friendly travelers, but it intentionally does not have a party atmosphere. The hostel does organize some fun events for guests including community dinners, hiking trips, and trips to the market. This is a great place to stay if you want to soak up the local culture in a pleasant and comfortable setting. This hostel is conveniently located just 250 meters from the main bus station. The hostel organizes a lot of social events for guests, so it's a popular option for solo and independent travelers. Regular events include Monday night movie nights and pancake breakfasts on Tuesdays. The staff also regularly organizes sightseeing tours and activities. The hostel has a great layout for socializing. There's a large common area as well as a large garden and a terrace. There's also a barbecue area that you can enjoy. Rooms are big and many have balconies. There's a shared kitchen available to guests as well. Both private rooms and dorms are available. You can choose between twins or double private rooms as well as five or eight bed dorms. Female only and coed dorms are both available. This hostel is conveniently located on Zagreb's main street and is accessible to many sights and attractions. It's a fun place to stay with a terrace and outdoor garden that many guests enjoy. There's also an attached bar that is popular with tourists and locals alike. There are a range of rooms available including private rooms, apartments, and dorm rooms. Dorms range in size from four beds to eight beds. The price and value is good, and there's something for everybody, regardless of their budget or travel style. The hostel includes all of the standard amenities and the staff is friendly and helpful with any questions you may have. This is a good place to stay as a solo traveler who wants to meet other guests.